Books | "Jesus Only" Churches | Watchman Fellowship, Inc. Unlike Jehovah's Witnesses, who deny the Trinity by demoting Jesus a mere man, the "Jesus Only" churches deny the Trinity by claiming that there is only one God, and that Jesus is the Father and the Holy Spirit. "Jesus Only" churches not only require baptism for salvation, but also stipulate that it must be baptism in the name of the Lord Jesus Christ only, and not in the name of the Father, the Son, and the Holy Spirit. Thus, these churches distort the gospel and the historic, orthodox understanding of Jesus. 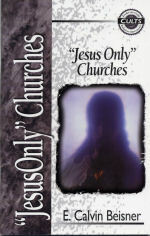 In this book, you will find: a concise introduction to "Jesus Only" churches, an overview of the movement's theology - in its own words, a biblical response, tips for witnessing effectively, a bibliography with sources for further study, and a chart comparing the movement's beliefs with biblical Christianity.